If something critical is happening in the area where you live or work would you want to know? Read below to find out how you can get critical public safety information directly on your iPhone (or any cell phone capable of text messaging). Your life and the lives of the ones you love may be affected by an event that you don’t even know is happening. These events can range from a vehicle crash causing a temporary road closure, to a gas leak leading to a neighborhood evacuation, to an active shooter situation. How do you find out about these types of events? Certainly Twitter and other social media can be an effective form of communication, but there is a nationwide communications service called Nixle that will send the information from participating public safety agencies, via text message, directly to your mobile telephone at no cost to you. 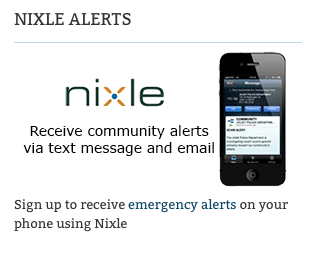 Nixle is a service that allows public safety agencies to communicate alerts, advisories, and community information to the public via SMS (text) messages, emails, and the web. The Nixle service is a nation wide service. The service is free to public safety agencies and free to the public. (They make money by selling optional premium services to public safety agencies.) Register online and you will be able to view which agencies in your area are currently using Nixle. How do you sign up? There are two ways to sign up for the Nixle service. 2. 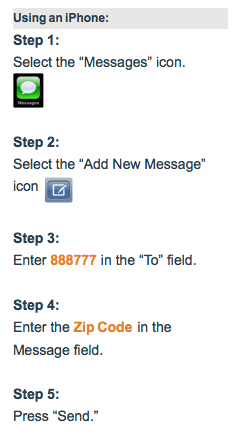 Phone method – Sign up from your iPhone (or any phone that can send and receive text messages) by texting your zip code to 888777. While the majority of people sign up for alerts directly from their cell phone, I would encourage you to sign up directly at the Nixle website. There are some advantages to registering directly on the Nixle website. 1. 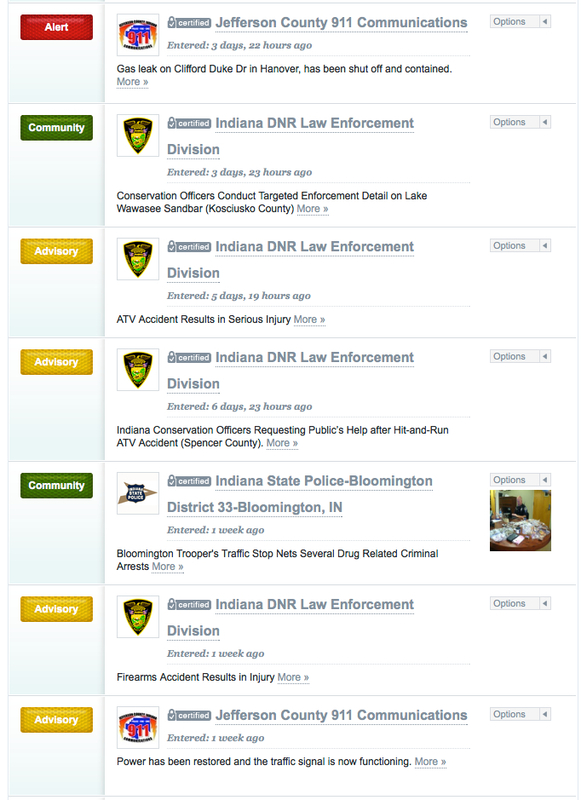 On the Nixle website you can see all the agencies in your area that are currently using Nixle. Example of the author’s Nixle Wire feed from the Nixle website. 2. You can register an email address that allows you to receive more detailed information from the agencies. 3. You can fine-tune how you receive these alerts. You can not only choose which agencies you want to receive messages from, but also how you receive those messages. For example, you may want to receive some messages via text message, some from email, and some just on the website. 4. You can set a do not disturb time period if you do not wish to receive messages while you are sleeping. For example, you might set the service not to send messages between 10:00 p.m. and 6:00 a.m. I would suggest that if this is something you are considering that you instead try using the website to select receiving Alert messages only via SMS so that you do not miss what could be life-saving information. 5. You can select a number of different locations to receive information about. In the screenshot below you can see where I have added not only surrounding county zip codes but specific locations such as my church address and mother’s address. Adding these additional locations will allow me to receive public safety information about areas I am at regularly that are outside my normal home and work locations. This will allow you to monitor an area and alert a loved one who does not use a smart phone. Nixle Settings Tab allows you to fine tune how you receive messages. 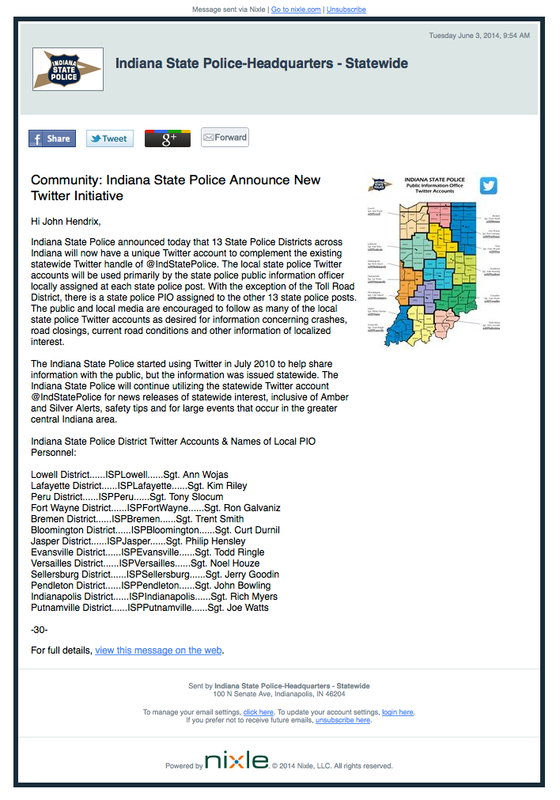 Shown below is an example of a community message from the Indiana State Police. These type of messages are normally received only via email, which you must register online at the Nixle.com website to receive. While Nixle is certainly just one of many of these types of services that are available, I think the Nixle service is worth signing up for. 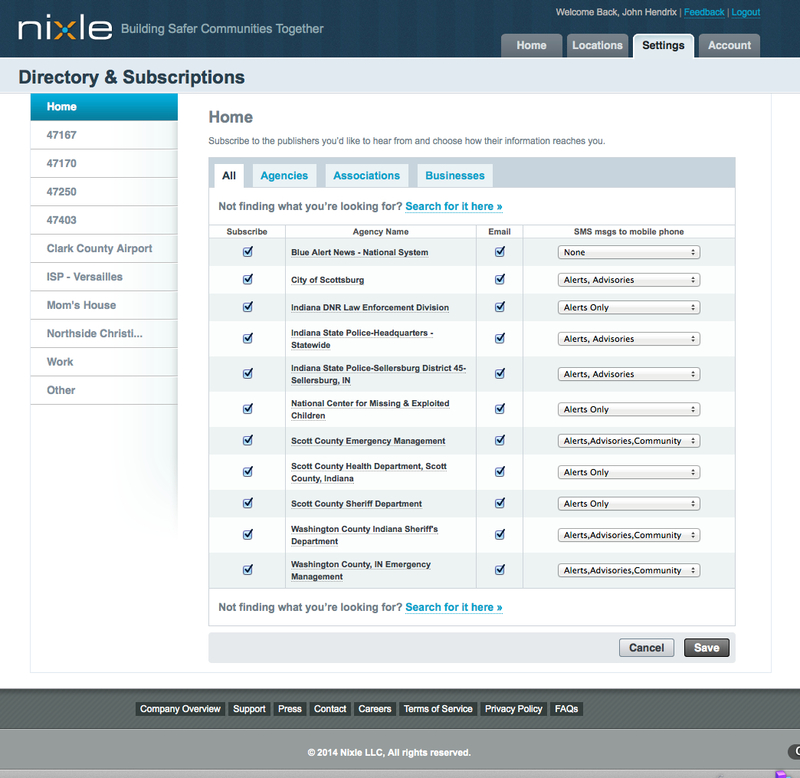 Nixle offers their basic service for free to any public safety agency. In a day of tight budgets, most public safety agencies are trying to do more with less. I think Nixle will grow because it offers a valuable basic communication service at no cost to the agency or the public. Nixle is also now expanding into the school sector as well. For you as a subscriber, even if a specific local agency does not currently use Nixle, if they do in the future, you will immediately start receiving their messages if you are already signed up for that zip code. Additionally, you should check with your local public safety agencies to see if there might be an alternate service that they currently use. Nixle is free to the public and is available at www.nixle.com.